When Google announced the Chromecast Ultra, it was made quite clear that to take advantage of the dongle’s 4K capability, movies in UHD resolution would soon make their way to Google Play. As of this week on Google Play Movies, that process has begun. Currently, from what folks on reddit and I have seen, The Fifth Element, The Da Vinci Code, and On Any Sunday are the only titles you are able to purchase in UHD. Others reported seeing the new Star Trek, as well as Zoonlander, available at the UHD resolution. As you might tell, the rollout seems quite slow and finicky, so there’s no telling how many other UHD titles are out there – we just have to find them. 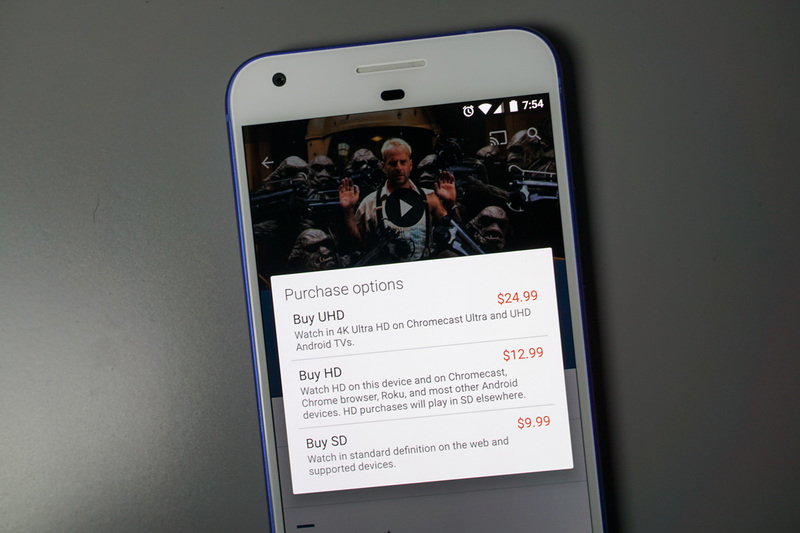 In order to discover and purchase these titles, it appears that you will need to be browsing with the Google Play Movies app. For me, looking through the Google Play store was not working, but it may work for others. As for pricing, UHD is more expensive than SD or HD, naturally. The aforementioned titles are all priced at $24.99 a pop, except for On Any Sunday which is just $12.99 for UHD. Feel free to debate whether or not higher resolution is worth that price. If you spot a few more UHD titles on Google Play Movies, list them below and we will get a list going!